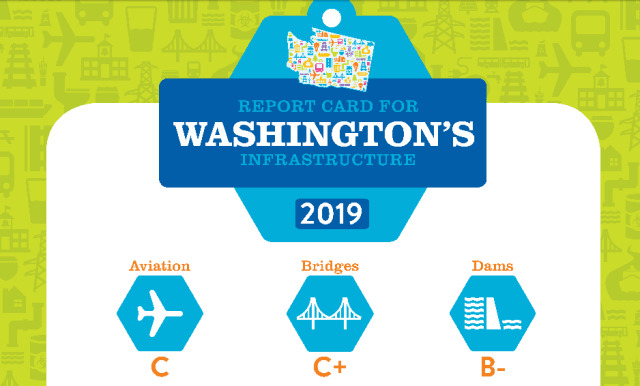 The American Society of Civil Engineers has given Washington State an overall grade of “C” on its infrastructure report card. The report card, created by the Inland Empire, Seattle and Tacoma-Olympia Sections of the ASCE, was modeled after the national ASCE report card. The average grade is the same as the last Washington State report card in 2013, but higher than the most recent national average of “D+,” recorded back in 2017. The state received a B- in dams; C+ grades in bridges and in schools; C- grades in drinking water, roads, transit and wastewater; and a D+ in stormwater. “A blanket statement for all these categories is that there’s an investment gap. There’s this trend of long-term neglect of funding,” said Richard Fernandez, chair of the ASCE’s Washington Infrastructure Report Card Committee. However, there are some encouraging trends buried in the data. All the transport-related categories (except for aviation) showed improvements since the 2013 report. These category improvements appear linked to increased transportation funding over the past few years. In 2016, Washington implemented an 11.9-cent gas tax increase, with the proceeds going toward the repair of structurally deficient bridges. “This is straight from the people who are voting; they’re saying that this is important and we’re not where we need to be,” said Fernandez. Currently, much of Washington’s stormwater infrastructure is beyond its design life, but the state has taken steps to improve it, and the state leads the country in areas like managing stormwater and wastewater separately. “The bigger cities here are viewed as a leader in stormwater management: doing things like biofiltration or retention on-site before releasing it versus just shedding the water quickly, which is the old way of thinking,” said Fernandez. One of the biggest ongoing projects is the treatment plan in King County, which aims to handle combined sewer flows into the Duwamish River Basin. While dams have the highest grade on the report card, the grade for this category has slipped since 2013. Many of the dams in the state are past their 50-year life expectancy, and funding has slipped over the past few years. Most dams in the state are privately owned, and inspections have taken a hit in recent years. Fernandez and his colleagues recommend higher funding for dam inspections, as well as making low-interest loans available to dam owners so that they have the capital on hand to make needed repairs.